Love the app. Request or suggestion: how about adding some “Plena” (from Puerto Rico)? That would make app pretty much perfect. Thanks for your hard work. I want Japanese correspondence and manual. There is the samba carnival of the scale next to Brazil in Japan. Of Escolas get completely exhausted; surdo.caixa. of the rear…etc. Nuance (groove) is not exact. Mr. Martinez, are you planning to outfit your apps with Ableton Link? I’m a veteran bassist and, in recent years, bajista in the San Francisco Bay Area. (I play in a couple of salsa, timba, and latin-jazz bands.) I have a question, the answer to which would help me immensely in getting the most out of your app. I purchased your full Afro-Latin DM after trying the lite version. I’m very pleased with the app. I use it on my iPad for my own practice, and for accompaniment while I teach my students about Afro Latin bass playing. Here’s my question. What text material would you recommend to understand the acceptable options to use for various Afro-Latin styles. 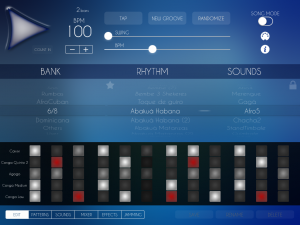 For example, your app has lots of percussion instruments and beats to swap in for a son montuno. As a bassist I need to learn what’s considered a standard instruments in te bacteria, the standard pattern to use behind the son clavé, etc. Pardon my ignorance, but having a good reference to styles on congas, timbales, bongos, etc., would help me design DM beats that let me practice and teach more effectively. In short, this will make your app far more valuable. Descargué la app y la pagué pero en mi celular solo la puedo usar un rato, al dejar de usar ya no la puedo abrir, te go que descargarla y volverla a cargar para poder usarla nuevamente, este problema solo es en mi iPhone, en el iPad no se ha presentado. Que hago? Necesito usar también en mi celular. Amigos de lumbeat ,gracias por sus apps. Me son de gran ayuda. Mi comentario es si podrían poner bombo a la app, de afrocuban. Y por ahí alguna app o ritmos de landó peruano seria de gran ayuda. El tiempo no es el que corresponde esta doblado el tiempo del patron de ritmo sobre el metronomo pueden arreglar eso ?